This Friday, the 13th, Historic Downtown Maplewood will host its 13th annual Let Them Eat Art festival. This art fest is held each year during Bastille Day. 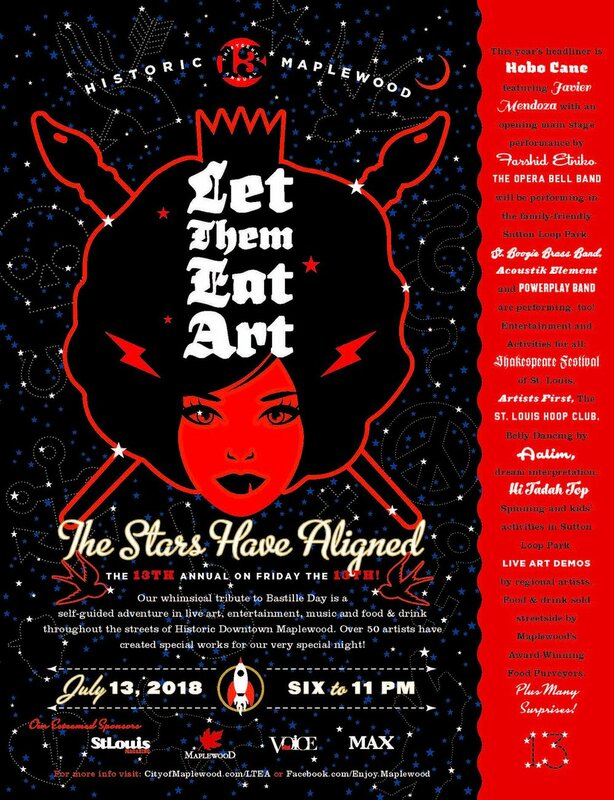 Let Them Eat Art will feature live art demonstrations, live music, food and drink and will be held in the streets of Historic Downtown Maplewood. Let Them Eat Art is a self-guided event kicking off at 6 p.m. to 11 p.m. Check out the list of activities to curate your own tour! Hobo Cane featuring Javier Mendoza, 9 p.m. to 11 p.m.
More than 50 artists will show “Friday the 13th” exclusive interpretations of art in celebration of this superstitious Bastille Day. This year’s celebration is a must-see collection of artists. Let them eat art! To view the full list of artists click here. To view a list of exclusive “Friday the 13th” creations click here. To see information on street closures and parking click here.